The 58' Donzi 2003 has a true classic look with a modern soul! : Atlantic Yacht & Ship, Inc. The 58′ Donzi 2003 has a true classic look with a modern soul! “Little Pipe” is a 58′ Donzi 2003 sport fishing machine! 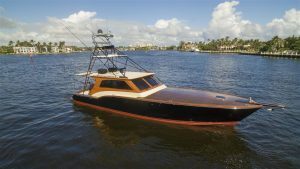 She represents the absolute finest example of a sport fishing yacht constructed in today’s market. As a matter of fact, this Donzi took twice the time to complete as her predecessors. Built with no expense spared. This vessel represents an unbelievable investment of time and meticulous attention to detail. The current owner and builder collaborated to create an unbelievable achievement. Her lines and appointments are second to none. A true classic look with a modern soul! Entering the very large cockpit of the 58′ Donzi 2003, she is covered in premium grade teak. The glistening varnished teak bulkhead is forward and centered by a Blue Water fighting chair. The chair is removable and easily replaced by a large varnished teak table. A custom leather sofa seat has been built into the cockpit bulkhead to provide the ultimate comfort while cruising or fishing. Overhead, are Twin Rupp Outriggers and her Custom Pipewelders tower. The tower steps were custom made for each rung with a custom fit piece of solid teak. Inside the bridge, there is plenty of seating for relaxing and entertainment. The full 360 degree views through the over sized windows provide an open feel for all traveling owners and guests. The aft bulkhead of the vessel is custom fit with and Eisenglass enclosure which can be removed for a full open feel. “Little Pipe,” grabs the attention of all who pass! Click to see a video of “Little Pipe,” on our YouTube channel. Contact John Slate at Atlantic Yacht & Ship, Inc. for a private showing and more information. Furthermore, the 58′ Donzi 2003 will be displayed at the Palm Beach International Boat Show March 22-25, 2018. For more show information and where she will be located, click our Event Calendar. The 31’ Jupiter 2003, “Changes in La Attitude,” just reduced by 30K! Survival 101! The Do’s and Don’ts of any Boat Show!